High on the triumph of finishing things in the final weeks of 2015, a new hat included, I decided I needed to do right by that hat and give it a new pair of gloves to match. I had 3 skeins of this turquoise Ultra Alpaca in my stash and only used about 1.2 of them on the hat so there’s enough yarn to work with. Plus, it’s feels good to have a matched set of things. I started out thinking I would just do a basic pair of gloves and get them done as quickly as possible, since we’ve got actual freezing temperatures now and let’s not wait too long to get these babies out on the road. But then I just decided to go full out and do another pair of Chilly Podsters. I’ve knitted 2 pairs of these already and have gotten so used to them that I’d miss the little thumb hole and mitten-top/cropped fingers combo. it’s a bit more fiddly than regular gloves, and a little less fashionable looking, let’s be real, but I can live with that. The cold temps are a good motivator to get them finished. 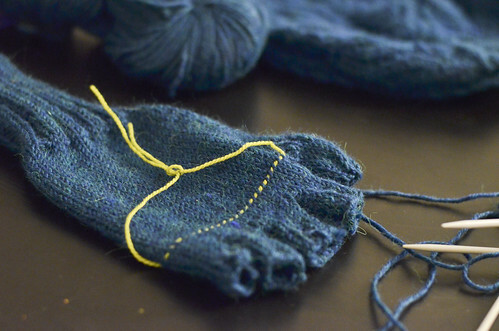 I’m making it a bit easier on myself by doing as much of the fiddly-ness out of the way, doing both gloves up until the fingers and thumb, and will work both mitten tops later on. Once these are done I might just carry on with an accessories jag. The speediness of new winter hats is pretty tempting. I hope you’ve got some fun projects this week and that your motivation is in good supply! Getting to wear the finished things is always a good goal post. I was just thinking this morning that I ought to dig out the leftovers from a sweater (finished last spring, worn this week) and knit them into a warm hat to combat our first sub-freezing temperatures of the season. Despite loving hats and scarves, I’ve discovered I have a woeful shortage of them. Do you tend to knit your accessories to match specific coats, or do you like to do a lot of mixing? I have yet to try a pair of mittens / gloves! I’ve been collecting patterns on Ravelry and hope to get to a pair soon. 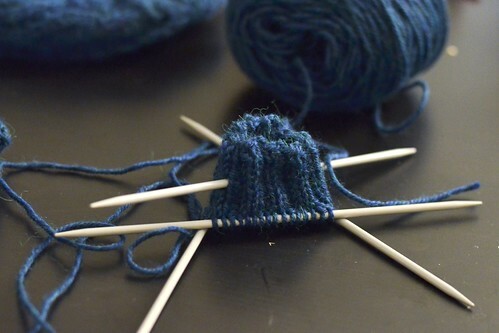 I think that hand knits are so much warmer than store bought and can’t wait to try my first pair! Those look super cute and I’ve just added the pattern to my library. Love the blue yarn. I am getting ready to do some swatching for a sweater I am going to start. Happy New Year! I have knit myself a pair of these a few years ago out of wool/alpaca blend. I still wear them and I love them. Yours look like they’ll be very warm.